As veteran wearer of contact lenses, I’m fine with eyes. I don’t mind touching my own eyes, and I’m pretty confident that I can touch someone else’s eyes without hurting them. My boyfriend on the other hand, cannot stand anything approaching his eyes. He even flinches when I take my contacts out. Once for fun I pretended tried to lick his eye and he completely freaked out. Now, I don’t think my love could take more than a few chapters of Eye Spy. Even I, person that has once stabbed a fish in the eye to see what happens (in a biology class, and yes, the fish was dead beforehand), was absolutely disgusted. Eye Spy is deliciously revolting, and it revels in anything gross related with eyes. The plot is simple. An eye surgeon, Kaine, goes to operate on a president in a totalitarian country, and tastes a wonderful delicacy there. When he asks what the secret ingredient is, the president reveals that they are made with the eyes of prisoners. Kaine becomes addicted to the eyes and their intellect-boosting side-effects, and figures out different ways to eat them and get his supply. Usually books like this are one-trick ponies. 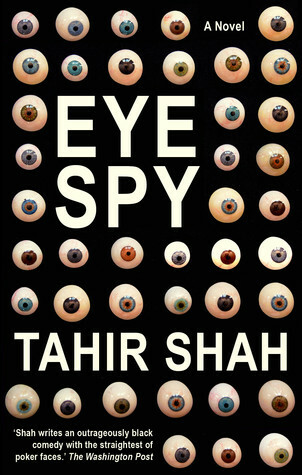 What I enjoyed about Eye Spy is that it’s well-written, and conflicts keep arising to keep you reading. Especially the last few chapters were nerve-wrecking. The book is filled to the brim with sarcastic dark humour and bizarre situations. If you can get over the image of a guy slurping a few eyes from a spoon, I recommend giving Eye Spy a shot, and prepare to feel slightly nauseous. The greatest eye surgeon of his age, Dr. Amadeus Kaine is fêted by royalty, dictators, Hollywood, and the international jetset. An epicurean of sophistication and dark obsessions, he’s devoted his life to locating the perfect food. While treating one of Central Asia’s most depraved despots, Kaine is given a little pie to eat – a delicacy reserved for guests of the president. It’s the most delicious thing that’s ever passed the surgeon’s lips, and one that has seemingly miraculous effects. An eye disease that has jumped the species gap from industrialized poultry farming, the virus rips through society, robbing the masses of their sight. The only man who can save the world is the inimitable Dr. Kaine, who is himself on the run. One of the strangest tales of obsession, mania and intrigue ever told, EYE SPY will quite literally change the way you see the world.